Business methods raise issues of 35 USC 101. There was a time when having computers doing things could not be patented. The Diehr and State Street cases will be discussed. Teaching, Suggestion and Motivation (TSM) occured due to the Supreme Court case of Graham v. John Deere Co., 383 U.S. 1 (1966). A second Supreme court case called KSR concerns the issue of obviousness as applied to patent claims. An examiner can reject a claim based on common sense of a person having ordinary skill in the art (PHOSITA). Common sense is a perception and Voltaire has stated "Common sense is not so common." If you are interested in obtaining a patent, this talk is a must see. Claims are typically partitioned into apparatus, method and "means for" type language. Some of the mystery of reading claims is uncovered. Terms covered include : antecedent basis, negative limitation, etc. Time permitting a patent case may be presented. 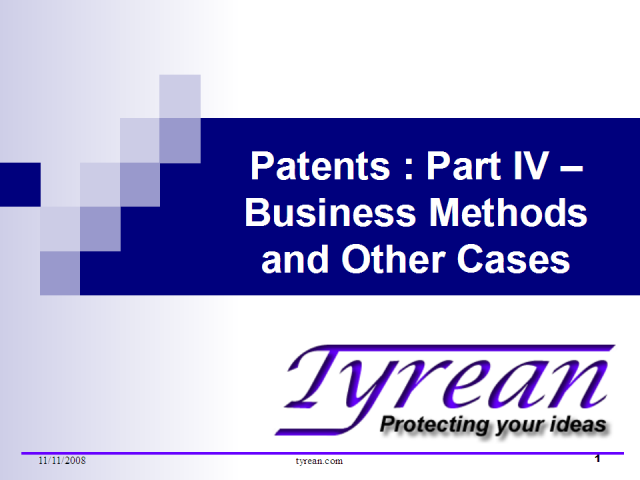 The basic fundamentals of patents are presented. The history, rights and types of patents are addressed. The required components of a patent application and topics that can not be patented are detailed. Patentability issues based on basic law and a description of 35 U.S.C. §101, §102, §103 and §112 are covered. Live monthly webcasts for Inventors, Technologists, and Startups. Simple description of patents: how to turn an invention into a patent, how they protect your rights, why do you need them, and how much do they cost? Talk presented by Thad Gabara who holds over seventy patents and is licensed to prosecute patent applications before the United States Patent and Trademark Office.